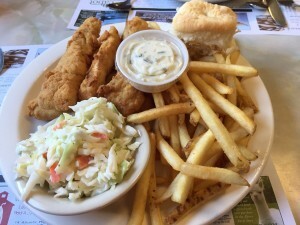 Coming back from Owl's Head, we needed a quick stop for lunch and Moody's in Waldoboro fit the bill. It is an old-school diner, right on Route 1, which has been feed hungry travelers since 1927. Steve got a hot dog ($2.80) and onion rings ($2.89) while I had the battered haddock and fries ($11). 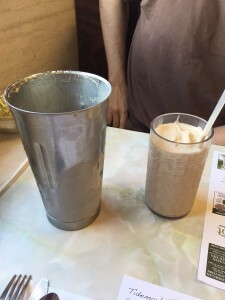 Steve also got a coffee milkshake ($4.5) which, appropriately, came with the large metal canister. My fish was over battered, but it was a generous portion. I took half of it home and made fish tacos with the leftovers the next day. The fries and onion rings were pretty good, and Steve's shake was perfectly thick, creamy and delicious. Moody's is known for their assortment of homemade pies and so I tried the coconut cream ($4). 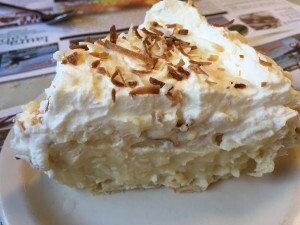 It was visually pleasing: thick glossy custard with a mound of whipped cream and toasted coconut shavings on top, but further investigation revealed a crust that was massively under baked. The flavor of the custard was good, so I ate the filling and left the crust. The prices are reasonable, and the service was friendly. Moody's is an excellent place to stop for a quick bite if you are traveling on Route 1 in Maine.